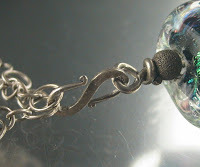 So – I was out of bails one day … and had already wired up the pendant, and the loop was too small for the chain. I didn’t have a jumpring big enough or sturdy enough – but I did have some of these “S” shaped clasps. So I used that to attach the pendant to the chain. And it works really well – and now it’s a device that I use on purpose, instead of as an act of desperation! 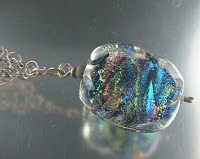 And, as a added bonus, you can use it if you want to swap pendants on and off a chain. Remember to bend the wire to the side – just like jumprings – to open it. Don’t pull straight out – doing that repeatedly will fatigue the metal and it will break. And, we have some of these “S” hooks in copper coming live on the site on Wed! I am planning to use those clasps as a link on tne sides of a necklace. They are quite useful, as well as attractive. 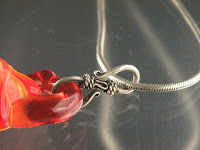 I have also used a lobster claw clasp to attach a big puffy copper heart and it can then be swapped. Learned something from you though…I was pulling it straight out, not sideways, sigh. But only once when using it as a clasp. How big is that one of yours?? 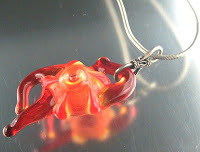 The bigger one, on the red pendant – is about 18 mm.